What is a drop shot? Well, quite simply, it is like a dink, but it is hit from a distance further behind the kitchen line. If executed properly, you can hit this shot from anywhere behind the kitchen line. It is usually the preferred drop shot and is used by many upper level players. This shot should only be used by 3.5 level players and up since it is quite difficult to learn and you need to learn some fundamentals first. So, why should we use drop shot? How do we use it? Let’s find out! 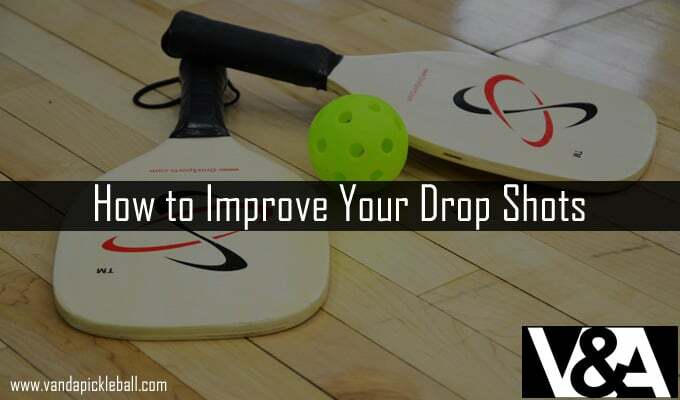 What Is a Drop Shot? This is when you want to hit the ball from the base line into the opponent’s kitchen. But players can struggle to do this correctly, and will often hit it too far and messing up their strategy. Don’t worry if it happens to you, even 5.0 players struggle to get this one right. Don’t try and use a soft shot, since this won’t have the power to drop it into the kitchen. You also don’t want to hit it too hard since this will end up going right to your opponent,which won’t do you any favors. Remember to keep your body low through the shot and when you hit the ball. This will allow you to hit it up and drop it into the kitchen. If you pop up too early, then you could ruin the shot and turn it into a normal shot. Leave the paddle face open, and go through with the shot like a normal shot, just be sure to hit it a little more up. A drill is the quickest way to get your body used to a new shot. So, what you’re going to do for this one, is go to the base line, put your paddle down and get your ball. You’re now going to toss the ball lightly, staying low and using all the tips we just gave you. You’re going to have to do this 10-20 times before you really get it. Once you’re happy with your trajectory, you’re going to start doing the same thing with your paddle. By doing this drill a few times a week, you will be able to perfect your drop shot. You want to use low, arching shots. You need to stay low to the ground, so that you can hit the ball up. Don’t hit it too hard or too softly since you need it to drop into the kitchen. Go through the drill with your hand for 10-20 times and then you can graduate to your paddle. Once again, we cannot stress how important it is that this shot not be attempted by beginners. It could wreck your confidence or make you feel like you aren’t progressing- which you are. If you can start using it, be careful not to use it too much since this will make you predictable.